Next on the loom is a Honeycomb weave. It’s funny in to have chosen this, since it is also know as an undulating weft effect and my previous post was on an undulating twill. The inspiration for this project came from shopping for a bargain at the local “Big Lots” store. Here I found in the craft aisle jute cord meant for kids jewelry. The rainbow colors struck my eyes as the perfect color combination to be used for a runner. The jute is used in the weft for creating the outline for the cells. The warp and weft yarn for the interior of the cells uses a single ply linen. In the Shuttle Craft Monograph #9 – Undulating Weft Effects by Harriet Tidball, she states that the warp should be fairly fine and elastic, while the weft should be the same as warp or finer. The weft outline should be thicker and soft and elastic. Linen should not be used for outline weft due to it’s stiffness. A soft cotton yarn would be a good choice for outline weft. My yarn choices could be considered to be poor choices. The Jute yarn required some hand manipulation for the cell outline and the linen yarn in the warp and weft is anything but elastic. I experimented with the number of linen wefts in each cell and settled on 8. The finished weight is wonderful for a table runner. I need to do the finishing and then will share a picture of the finished project. 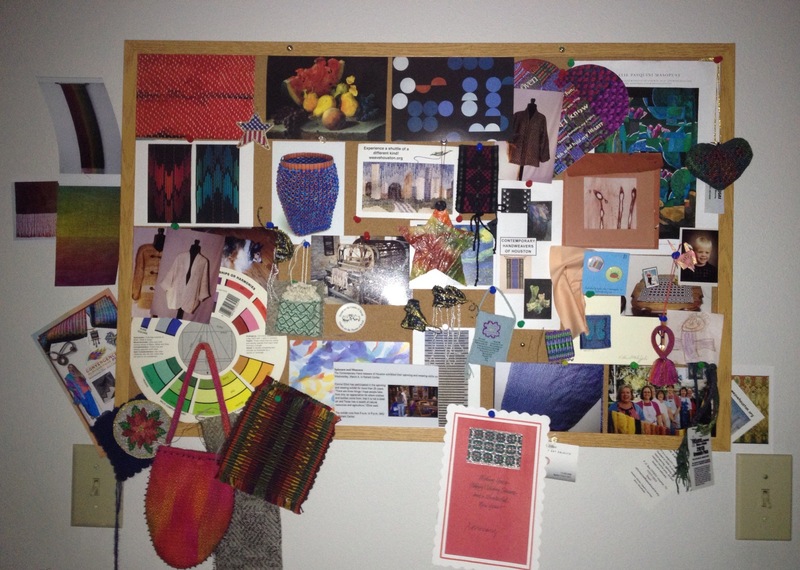 In my Weaving Studio there is a cork bulletin board that is filled with images of past projects, postcards of famous art work, and images from magazines, and brochures from the guild I belong to. There is a photo taken in a state park in Kansas of an antique industrial weaving loom. Small woven items created by myself or friends also adorn the board. These are all items I enjoy looking at and using for inspiration for future projects. My larger loom sits in my livingroom where visitors and everyone in the house pass by it often. I have had a Summer and Winter piece designed for a study group project on it for nearly 2 years. The design was inspired by the backsplash tiles in our remodeled kitchen. After weaving off samples and 2 towels, I tweeked my lower back. Alas, I could not get myself to go back to the loom to complete the last towel which was half done. The piece wasn’t a dog but a nice art piece on the loom. I needed the loom for a larger piece that could not be woven on my Baby Mac loom. I’m proud to say the towel was completed and a new work is in the process of being threaded.